Our third conversation is with Jaimie McDonnell ’16 (women’s ice hockey). After receiving the email, the first thing I did was read the entire Coach for College website, searched Google for everything there was to do with the country and even bought a Vietnamese dictionary! I definitely was expecting a very rural place with a lot of forests and greenery. I expected a third world country with poorly educated children (which was not the case) and that I was going to have an amazing opportunity to help make their lives better. Wow, there are so many things that I could talk about. Culturally, there was a lot to adjust to or just to take in. I just remember it was 45 degree Celsius (113 degrees Farenheit) in Ho Chi Minh City and the hundreds of bikers and pedestrians around were dressed in jeans and long shirts with facemasks and hats. I found out after I asked one of the returning staff members that a tan signifies poverty and is considered unattractive. On site at the school it was very eye-opening to see what is considered “normal.” Water was not drinkable so we had to bring jugs, the classrooms only contained the necessities to teach and the sports fields were almost nonexistent. Probably one of the most prominent and fun differences was bargaining, you had to argue down every price especially souvenirs because there were not really any set prices in the markets and they could charge you whatever they felt like; definitely kept you on your toes. The food was another part of life that took a little to get used to. Everything was cooked that day, was bought on a meal-by-meal basis and came directly from the farmer at the market. You had to get used to a whole fish getting placed on the table in front of you. The fruit was probably my favorite part, I really enjoyed lychees, mangosteens and langsats. I was very fortunate to have been assigned Math as my subject to teach because I was able to teach and guide students through problems without the use of much more than numbers, which I picked up very quickly. For everything else though, we had Vietnamese coaches who would translate what we were saying. I think the program is so successful because of how hard working and awesome our Vietnamese counterpart’s are. Just that added connection of being able to understand and hear all the children’s thoughts and dreams made the program so much more beneficial for me. 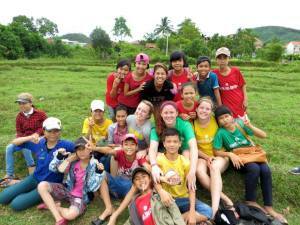 The children were amazing, they were all so passionate and hardworking that I did not want to leave. They were so smart too; the mental math skills that I witnessed put me to shame. At the beginning of the program I believed that there was no way I was going to be able to relate to them or get to know them on a personal level but I could not have been more wrong. I came to know their hopes, dreams and goals, which only made me more in awe of them. To hear the challenges that they face everyday just put in perspective how lucky we are to have the access and opportunity to education here in North America. We would usually wake up around 5:45am and head downstairs for the breakfast our hosts would make us – usually noodle soups or fried eggs. Classes started promptly at 7am so we had to be there a little early to set up water jugs and the classroom supplies. We started the day by teaching life skills, a class dedicated to character building and goal setting, we would then teach our respective sport and subject twice. We went back to our guest house for lunch and a little downtime before returning at 1pm to do it all again but with another grade. We would end our day with clean up then board the bus to go back for dinner. After dinner we would shower and plan our lessons for the next day. It was pretty exhausting so most of us would be sleeping by 9. Our weekend trips were amazing; the program does an amazing job of taking the participants to different attractions each weekend. I loved the markets and the backpacker’s areas in Ho Chi Minh City, the beaches in Da Nang, the lanterns in Hoi An and the history in Hue. Being able to experience all of these with some incredible people made the trip memorable. One memory that pops out was going to a Karaoke Bar on the beach and singing a Taylor Swift song with the Vietnamese coaches! What is the funniest thing that happened? On the last day of the camp my team, who named themselves the Yellow Stars Who are Always Smiling, brought cake and a couple bottles of Coca-cola. They sang twinkle twinkle little star and has us blow out the candles which was so sweet and cute. Then when we least expected it, those cakes were in our face and the bottles of pop were exploding everywhere! I was still trying to clean myself off hours later! I feel that I am more conscious of the world and the experience has definitely helped me mature as a person. I think the program has helped shaped how I see myself and how I rank my priorities; it definitely provided me with some perspective. I have walked away from the program a better person with possibly a new career path in mind. What is the most important than you learned/realized from this opportunity? Coach for College is a major eye-opening experience. I feel that I am a lot more understanding and educated on the hardships that other people in the world have to face. It is one thing to read about what it is like to grow up in a third world country but it is a completely separate thing to experience it and immerse yourself in it. I learned that many of these children, no matter how hard they work or how bad they want to go on to higher education may never be able to. These children have inspired me to take this opportunity that I have so fortunately been granted here at Princeton University and make the most of it. Do it. Submit your application when the emails come out and do not look back. This program has been one of the most rewarding events of my life and I would not change it for anything. You will make so many great friends on the trip and be able to experience something that you may never have the opportunity to again. If you have any questions or concerns about the program feel free to reach out to me anytime. I just want to say again how thankful I am to CFC for allowing me the opportunity to meet such an amazing person as Otavio Fleury, who we tragically lost in a motorcycle accident this past September. 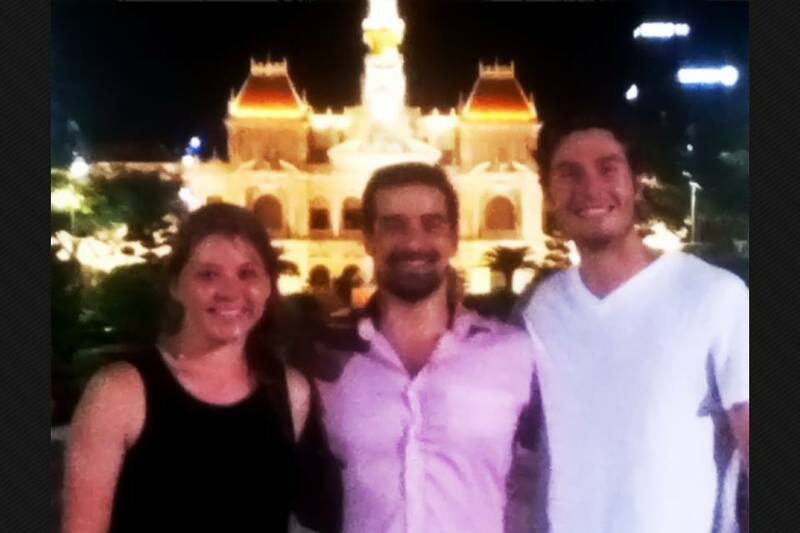 Being shown around Saigon, experiencing his passion for the area and hearing what he was doing with Tractus-Asia truly affected me. Not only was it one of my favorite parts of my trip but he also helped me realize what potential I have for social good especially coming out of the Econ department. He was part of what inspired me to change my career path and thesis topic. Thank you Princeton again for bestowing this great opportunity on me. Above is a picture of me and Otavio outside Ho Chi Minh City People’s Committee Hall.